Sorry, no rooms could be found for the dates you specified. Please enter new dates or choose a different hotel. Here are some nearby hotels available for your stay that you may be interested in. This beachfront complex is set in the Bimini Islands and 5 minutes’ drive from the Lost City of Atlantis. It features a sun terrace with swimming pool, an extensive garden and free Wi-Fi throughout. The suites, villas and studios with contemporary décor offer air conditioning, cable TV telephone and a terrace with views, and the bathrooms come with bath or shower. All present a kitchen with dining area, stove and fridge. The restaurant on-site serves international food, grilled dishes and there is a pizzeria and a bar. Resorts World Bimini, formally, Bimini Bay Resort also has an on-site grocery store and a shopping area. This resort also features tennis courts, a kid’s club, business centre, a gym, beach club and banquet facilities. Activities such as snorkelling, scuba diving, kayaking, kite surfing, wind surfing and swimming with dolphins can be arranged as well. 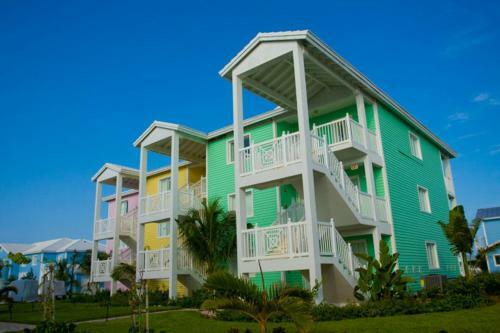 Bimini Bay Resort is 5 minutes’ drive from the Healing Hole and 90 minutes’ ferry ride from Miami. Guest score is not currently available.